Litter will be AKC registered, Dam is also UKC registered. 3 boys and 1 girl, all black. Born Sept. 10th, 2018. Note: May be delivered out-of-state. Ready to go early November. $200 deposit to hold & $950 total for female, $800 for male. •	QA2 CHUCK is out of NAFC-FC CODY CUT A LEAN GRADE and FIELD OF DREAMS BLAZE OF SUN QAA. •	PEEPER JH & SHR is out of FC AFC JET BLACK BUSTIN THRU THE BRUSH MH & KATE’S PRIDE MS CLEO JH WC. Breeding goals: Health, Great Temperament, Outstanding Drive with a wonderful off-switch. Great Marking, Trainability, Intelligence and Family Friendly. Within a 5 generation pedigree together they have over 78 FC & AFC champs, over 22 NFC & NAFC retrievers plus many Canadian NFC’s, Master Hunters and Hall of Famers. Chuck has been primarily amateur trained, he attained his QAA’s before age 2, he is an excellent marker with tons of desire. He is working on his AFC & FC, with many 2nd, 3rd, 4ths, and Jams. He loves hunting and enjoys his family life. Peeper has been trained by a greenhorn who loves working with her and is looking forward to Senior training. Peep is an amazing dog to travel with, her love for water, retrieving anything (especially ducks) and her family is boundless. Her marking has been first-rate for singles but we haven’t worked into doubles and beyond yet. Her memory seems to be solid however, so I believe she will do well. She runs very straight and strong. Peeper also does scent-work but we focused on hunt tests this summer. EIC & CNM Clear (via parentage) on both parents, Peeper was also tested for DM-SOD1-A and is clear. Hips, Eyes, Elbows tested and all is well. Peep has also been tested and is clear for the Cardiac exam. •	All pups will go through Early Neurological Stimulation which will be followed by exposure to a variety of environmental stimuli and situations. •	Swimming will be introduced at a dock diving outfit unless we have unseasonably warm weather. •	Feathers and some birds will be introduced as well as loud noises, possibly gunfire from a distance. •	Temperament evaluations will be done. •	Dew claws will be removed. Vet checked with a report for you and your vet. •	They will be Wormed & a Titer was sent in and this will determine the immunization schedule. 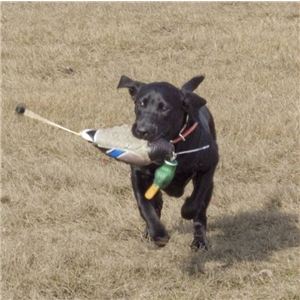 Open Space K9 is dedicated to producing Labrador Retrievers that are healthy with sound temperaments and high drive. We are a small family breeder and endeavor to maintain and improve the Labrador Retriever breed. We breed with top quality, proven retrievers and choose studs that are intelligent, trainable, dependable and eager to please. Both parents have full eye, elbow and hip clearances, they are also clear of EIC & CNM. Our female has also been tested and is clear of DM and rated normal for the OFA advanced cardiac test.